Sydney is famous for it's beaches, surf and sunshine. It's a tough one, but which Sydney beach has the best surf and sand? My favourite would have to be Balmoral Beach. It is so picturesque that it looks like it's from a story book. Across the road are a number of places to eat, and along the beach are so many green spaces that it's perfect to have a picnic. You'll often see weddings happening there, as it is just that pretty. I know, super tough. A tug-o-war between Bondi and Manly. I think Manly Beach is great, except for those pesky seagulls if food is around. Love playing beach volleyball there, and surfing those big waves. A great beach to walk. Also love the walking trail between Manly and Shelly beaches. I love the combined expanse of the Cronulla beaches. It's pretty much endless beach for about 9kms. Stick with the crowds or find your own quiet piece of sand. Cronulla and Manly are two of my favourites, but I like Bronte best. I think it's very family friendly with the huge parkland, and the surf is always great! Sydney has so many amazing beaches. Some great for their restaurants, others quiet and isolated. We usually go to different beaches for different reasons. When visitors come to Sydney I usually take them for a ferry ride to Manly beach. I like the vibe of Manly and the seaside restaurants and cafes are excellent. I also like Bondi Beach and the places that sell fish & chips there are the best in Sydney. 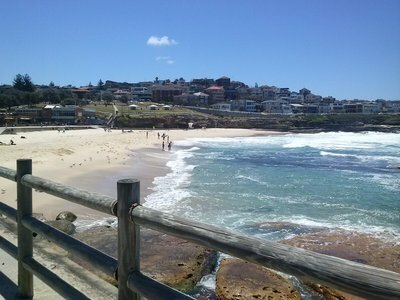 However the real joy of Bondi is the walk from Bondi to Coogee Beach and beyond. I know all the surfers have moved to Coogee but I still don't really see it as anything special. Another favourite is Palm beach. Not only is there the beach but you can take ferries to isolated bushwalking locations, go kayaking or sailing in the sheltered cove. Also people will be impressed when you tell them you went to Palm Beach (some people in Sydney are a little pretentious like that). For middle harbour beaches I love Balmoral. It is a great little location and a favourite place to go to watch the sunrise.